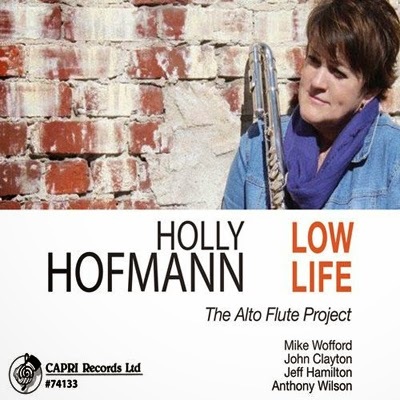 Holly Hofmann is one of the finest flautists ever to have graced the musical stage. Of course she began her career in the classical genre, but she expanded into the field of jazz back in the early 1980s, and she followed that path to fame. She has worked with artists who are tops in the jazz world — far too many to list — and has created an extensive discography over the years, with more than a dozen highly rated albums. Most of Hoffmann’s previous releases feature her on the C flute, but she plays the alto flute exclusively for this album. That instrument’s range is more limited, but it compensates with a tone that’s more lush. The supporting cast includes her husband, Mike Wofford on piano, along with bassist John Clayton, drummer Jeff Hamilton and guitarist Anthony Wilson. These gentlemen are in the top echelon of the jazz world: Wofford has been well known from the 1960s, both as an accompanist for stars Sarah Vaughn and Ella Fitzgerald, but also as a member of great bands fronted by Benny Carter, James Moody, Gerald Wilson and countless others. Hamilton, to many the finest drummer working today, has gained considerable fame with the Clayton/Hamilton Big Band; John Clayton is the Clayton in that same great group. Wilson frequently works with Diana Krall and numerous other name artists. All things considered, this group is the Rolls Royce in a fleet of other classic cars. Four of the tunes from the album menu were composed by group members: “Lumiere de la Vie,” by Hofmann; “Jack of Hearts,” by Wilson; and “Touch the Fog” and “Cedar Would,” by Clayton. The familiar Ray Noble gem, “The Very Thought of You,” is particularly moving; and Mulgrew Miller’s “Soul-leo” swings quite nicely. All the charts are beautifully done; whatever the tempo, everything swings wonderfully. You’re in the hands of true pros.